On some summer days, Six Flags New England is jammed - guests stream through the gate, hamburgers sizzle at the concession stands, and screams of delight echo through the park as riders plummet through the air. And up on the Superman: Ride of Steel platform, Jessica Johnston, 18, puts in long hours along with other ride attendant trainees. She and the other 3,000 workers employed during the season go through intensive training to prepare them for the thousands of visitors who come to the Agawam theme park, including learning ride safety rules, operating procedures, and park policies, and other regulations. Johnston, who just graduated from Agawam High School, is certified, or trained to operate Superman, and other rides, such as Cat Woman's Whip, Harold the Helicopter, Bernie the Bus, Cyclone, Catapult, and Scream. What's so great about the Superman ride? Are you kidding me? It's over 20 stories high, with a 221-foot drop, and goes 77 miles per hour with a mile-long track of twists and turns. What's not to like? So you must have ridden it a lot? I used to be afraid of roller coasters but my friends begged me and begged me to go with them until I had no choice. Now I'm a coaster fanatic; I ride Superman whenever I get the chance. When we're training, we can go on the rides over and over again. One time I rode Superman 26 times in a row. I did feel a little dizzy afterward, though. Kind of makes my stomach turn. You and a lot of other people. A lot of people throw up on Superman, as well as Cyclone, a wooden coaster, and Nightwing, a flying ride. We have cleaning supplies - dustpan, gloves, trash bags, disinfectant, the whole arsenal. We clean up the ride, and then cycle it once empty without any people on it to make sure the disinfectant has done its work. People get sick quite often on hot days, especially when they eat too much fried dough. There's a fried dough stand right outside Superman. It's not a good idea to have some right before you ride. The lines get pretty long for Superman, don't they? The wait can be up to two hours. People do things to keep themselves occupied, like juggle their hats and play hand games like Miss Mary Mac. Then we have people who try to cut in line but we have zero tolerance. You can get ejected from the park for that. What sort of questions do you get from the guests? The usual. Where's the bathroom; why can't I bring my backpack on the ride; why can't I bring this stuffed elephant on? People actually think they're going to take this big stuffed animal and strap them into the seat. It doesn't work. 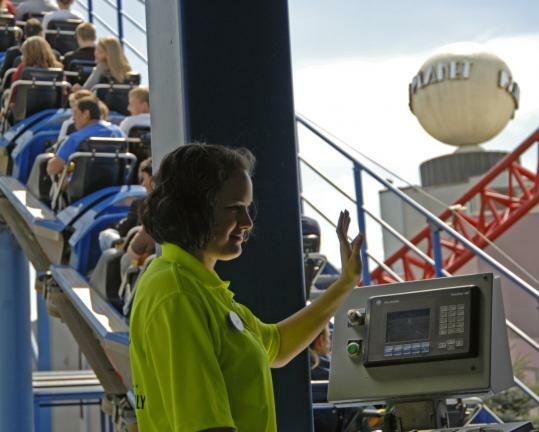 How much do you make as a ride attendant? I earn $8.50 an hour. Most ride hosts make a starting pay of $8 an hour. How do they train you to operate the rides? We begin with five hours of discovery training, when we learn about the park, customer service, and general safe practices. Then we go through six hours of general certification, followed by two to four hours of ride-specific training which includes going on the ride itself to experience it. We're here during the preseason, in February, before the park even opens. It can be fun, like learning the hand signals by playing Simon Says. "Simon says, 'all clear:' arm straight up in air, thumbs up; "Simon says, 'lock restraints:' two fists together. For safety purposes, every ride has a posted height requirement. Do people try to get around this restriction? Guests try to find loopholes. For Superman, for example, you need to be at least 54 inches and less than 76 inches tall. If they're too short, people will stand on their toes, or girls will show up on eight-inch heels. And you can be too tall - we have 6 feet 4 inch people trying to duck down. What about overweight guests? If you can't get the lap bar down, you can't ride. There's a test car available so you can see if you can fit in the seat. What are your plans for the future? I'm going to study education at Nichols College, but I love my job so much that I think someday I'm going to own Six Flags.